Yahad chairman not included in joint Jewish Home, National Union and Otzma Yehudit list for Knesset. The Jewish Home, National Union and Otzma Yehudit parties on Thursday evening presented their united list to the Central Elections Committee. Yahad chairman Eli Yishai was not included in the list despite efforts that went on until the last minute to include his party. Rabbi Rafi Peretz and MK Bezalel Smotrich, heads of the Jewish Home-National Union, agreed to include Yishai on condition that his spiritual patron, Rabbi Meir Mazuz, publish a letter of support for the united list. Rabbi Mazuz refused to do so, in part because of the presence of women on the list. 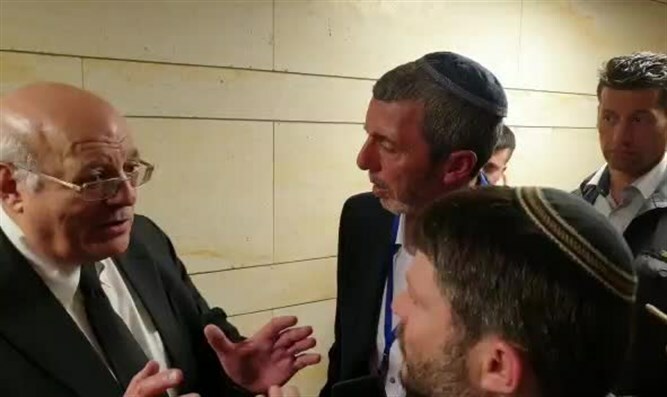 The rabbi also demanded that the connection with Eli Yishai be called a "technical bloc," but Rabbi Peretz and Smotrich refused. At the top of the Yahad list, after Eli Yishai, is Sasson Trabelsi, secretary of the Kiseh Rachamim yeshiva headed by Rabbi Mazuz. He is followed by Yehonatan Yosef, the son of Rabbi Yaakov Yosef and grandson of Rabbi Ovadia Yosef.